We’re lucky down under to live in a land of diverse flavours. Our multicultural heritage inspires us to smash down borders by modernising and blending our many influences. Take the Mexican cuisine, where many would link to all about corn, beans nachos and burritos. With modern influences from the Deep South of the US, and with flavours drifting up from a dozen or more countries in South and Central America, there is always something new to explore in this dynamic cuisine. Cross over to Japan, a completely different experience awaits. While Japanese food has started to include European techniques, ingredients and execution only relatively recently, keeping it real is what makes Japanese food continue to be a go-to for interesting ideas. And the inspiration can come from multiple levels. It could be top-notch fresh ingredients, either cooked or raw (karaage, tempura, sashimi), a combination of textures (crunchy, soft, slippery), a contrast in flavours (savoury, salty, umami, vinegary), temperature (hot/cold), a bit of punch (wasabi, yuzu, dried chilli), plus that consistent and delicate lightness that exists, even in fried foods. 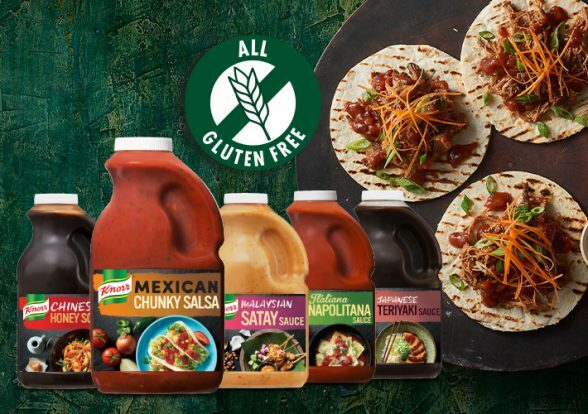 New Knorr World Cuisine Sauces celebrates the many influences of flavours from around the world, with a new extensive range including Mexican Chunky Salsa, Japanese Teriyaki Sauce, Portuguese Peri-Peri Sauce, Malaysian Satay Sauce and many more. All are made GLUTEN FREE to suit the modern dining needs. It doesn’t matter where we’re from, flavour rules every time! Add a twist from another culture or borrow a taste from another place. There’s a world of flavour out there to explore. Push the flavour boundaries with new Knorr World Cuisine Sauces. All Gluten Free.